Although highly successful career-wise, 48-year-old Jessica Hsuan’s (宣萱) love life has been empty since breaking up with her Italian boyfriend two years ago. Hoping to gain some luck with finding her other half, Jessica was seen visiting a feng shui stall in Causeway Bay area. Having received widespread recognition for her portrayal of the head-strong career driven woman in My Unfair Lady <不懂撒嬌的女人>, Jessica’s life mirrors her character Mall-Jeh, in which work took up the majority of her life. Despite her workload, Jessica remains a fairly active and healthy lifestyle – which can clearly be seen by her super fit physique even though she is nearing 50. With no luck with finding the right partner, Jessica visited a local feng shui stall the other day and spent quite some time studying the different crystals and looking at items that could increase her luck. While looking, Jessica even took out a small booklet from her bag and started asking the store employee questions – evidently having done some homework prior to visiting the shop. Jessica was seen leaving the place with a bag full of various crystals and lucky items. Having taken a look at Jessica’s luck, feng shui master Chan Zi Choi (陳子才) explained that Jessica is a headstrong, stubborn woman who doesn’t like compromising. Because of her career-driven mindset, the actress missed a lot of good opportunities to find the perfect match. Chan Zi Choi said that next year will be a lucky year for Jessica and someone will appear in her life. 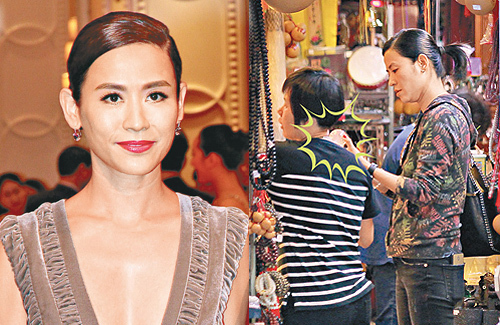 2 comments to Jessica Hsuan Uses Feng Shui to Find Mr. Right? Jessica Hsuan is too smart of a woman for superstition…I’d say go for Louis Koo. @peachyogurt I hope not, she is the same age as Louis. Louis deserves someone better and much younger. She should just stay single or go find another foreigner bf. It’s much easier to find a foreigner to take her at her age. Most foreigners are not that picky. I have non Asian coworkers who love to have Asian girlfriends. But the ones that reach a certain age like Jessica, It will be really hard to find someone who really want to marry her. I mean come on, she is almost 50. In another decade or less, she will be playing grandma in series.